Tamil comedy is not my usual choice of film. I think comedy is the hardest genre to understand in a foreign language and often doesn’t translate well unless it’s purely physical. Even then, cultural differences often mean that what is funny to the writer just leaves me baffled. But Boss Engira Baskaran was recommended to me by my local Tamil DVD store as an entertaining film and I have to say – it’s actually pretty funny! Arya plays Baskaran, commonly known to his friends and associates as Boss. He’s a happy go lucky guy who has never managed to pass his final school exams and has no gainful employment. Although he goes back each year to re-sit along with a group of other regular ‘failures’, he would have passed years ago if he only put as much energy into actual learning as he does into his attempts at cheating. 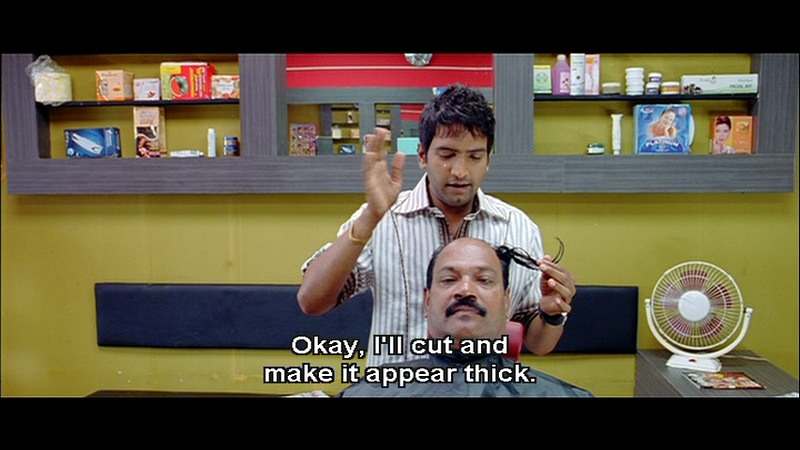 His best friend, Nallathambi (Santhanam) runs a barbers salon which he acquired as a result of his rather unconventional marriage. Baskaran spends most of his time hanging out with his friend at the salon and generally making a nuisance of himself. In the course of his latest attempt to pass his final English exam he meets Chandrika who coincidentally is the sister of the girl his sensible veterinary brother Saravanam is trying to marry. Despite the way in which Baskaran meets Chandrika and his subsequent idiotic antics, Chandrika seems fine with the idea of marriage. Perhaps she sees something in Baskaran that I don’t but he doesn’t seem like much of a catch for a well educated girl with a good job and excellent matrimonial prospects. It could be that this is part of the comedy that I just don’t get, but for whatever reason she encourages him in his quest to win her hand. To get the girl Baskaran has to try and persuade her father that he would be an acceptable husband, despite the fact that her father obviously despises him. His sister in law and the rest of his family point out that as he is unemployed and has no qualifications he has no chance of getting her father to approve. He leaves home determined that within 6 months he will have enough money to organise his sister’s wedding, an endeavour which he feels will demonstrate to his potential father in law that he is a responsible person who can support his daughter. Baskaran hits of the idea to run a tutoring college for students who are re-sitting their school exams. After all, it’s a topic he feels he knows a lot about. To start the business he borrows money from the local loan shark Velpandi – Rajendaran in bad guy persona. Needless to say things don’t exactly go to plan with the college and Baskaran runs around trying various ploys to make his project a success. The film slows considerably in the second half and although there are some amusing moments, I don’t find most of the scenes in the school funny. The pace picks up again towards the end, although the final scenes fail to match the comedy in the rest of the film. The ending feels tacked on more as an afterthought to tie up all the loose ends. Jiiva has a special guest appearance as Chandrika’s fiancée and its possible that I may have found this funnier if I’d seen M Rajesh’s previous film Siva Manasula Shakthi and had an idea about the previous relationship between the two actors – but then again maybe not. 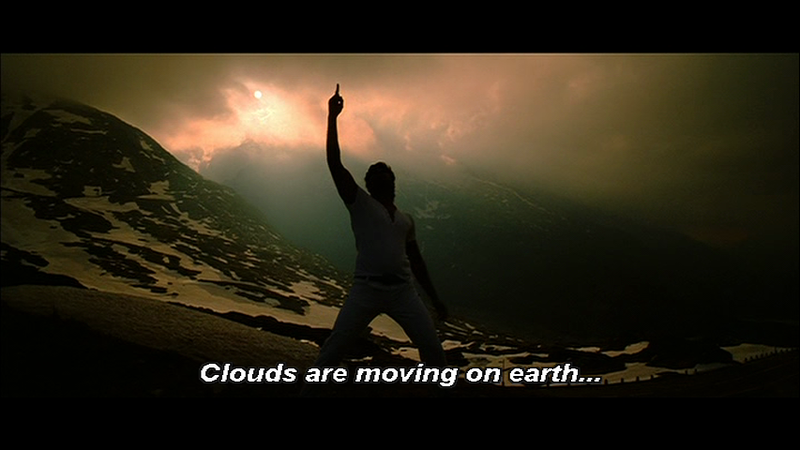 Most of the comedy is based on the dialogue with the best lines reserved for Nallathambi. Santhanam does an excellent job in the delivery of these as far as I can tell and he steals the show when he appears. There were quite a few references to old films and older film songs which I’m sure were all very significant. I think I felt much the same as a Bollywood virgin must have when watching Om Shanti Om! However, it was still funny even if I only caught a few of these – such as the salon being called Thala and Thalapathy, and the appearance of Rajnikanth’s Annamalai at a significant point in the story. I appreciate that unlike many recent Hindi films, or the often relatively unfunny comedy track, none of the humour is based on bodily functions or toilet humour. M Rajesh wrote as well as directed the film and deserves praise for his funny script and screenplay. Arya is surprisingly good as Baskaran. Having seen him in more serious roles in Varudu and Madrasipattinam I wasn’t sure how he would deal with a much more light-hearted character but he manages to impress. His facial expressions are more animated than I remember from previous films, his comedic timing is mostly good, and overall he strikes the right balance between ineptitude and stupidity for his character. Nayantara on the other hand is a bit of a disappointment. I expected more from her after her performance in Yarada Nee Mohini, but she seems very lifeless and there is no chemistry between her and Arya. Some of this may be due to the rather one-dimensional characterisation of Chandrika who just seems to be there as the love interest and nothing else. While Saravanam mainly plays the straight man to his brother there is still a lot of comedy in his role and Panchu Subbu is believable as the respectable vetinarian. Vijayalakshmi looks beautiful in her role as his wife Nandhini and brings a touch of grace and dignity to the film. I must look out for her in more films as she had such a lovely presence on screen. Chitra Lakshmanan as the father of Nandhini and Chandrika is a little too over the top, but his character is in keeping with the more typical Tamil comedy style for the father of the bride and he does well enough with this role. 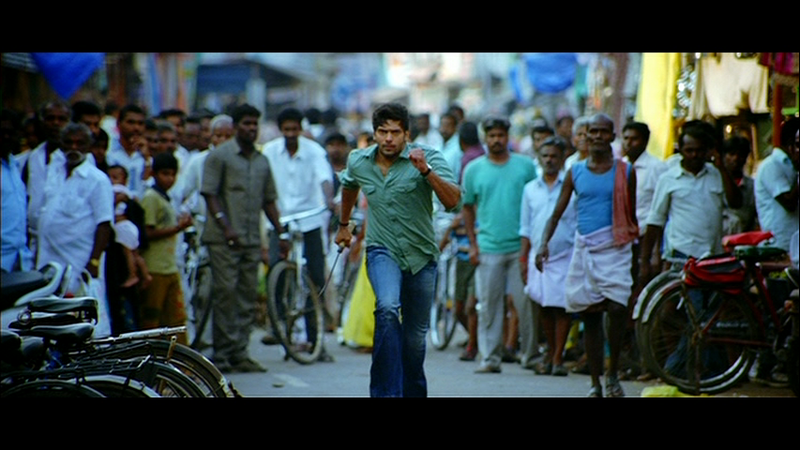 What works best is the first half of the film and the interactions between Bhaskaran, his brother and his friend. A better end would have helped, but I was impressed at just how well the comedy did translate to a non Tamil speaker. A film worth watching as a funnier than usual comedy with an excellent performance by Santhanam and a totally different side to Arya. 3 ½ stars. This entry was posted in Kollywood and tagged Arya, Boss Engira Baskaran, Chitra Lakshmanan, Jiiva, M Rajesh, Nayantara, Panchu Subbu, Rajendaran, Santhanam, Vijayalakshmi. Bookmark the permalink. Thanks for the link – sadly I can’t understand Tamil 😦 but I will look out for a subtitled copy 🙂 This was his first film wasn’t it? I really like Arya and I think he was good in the comedy scenes in this. So far he’s been great in every film I’ve seen him in, even if I haven’t liked the movie itself. I’ve been looking out for more of his films but it does look as if most of them aren’t available with subtitles. I’m finding that more and more as even many of the new films aren’t being released on DVD with subtitles – it’s very frustrating!